Using the best dog car seats from the early age of your pooch ensures the safety, protection, and optimum comfort level during car journeys. Most of the dog owners are not aware of the dangers when they bring their puppy on the drive without any security. According to the survey of American Automobile Association and Kurgo, there are 20% dog owners try to prevent their dog from jumping in the front seat while driving. It is so much risk for the driver, dog, car, human or anybody on the road. However, we have spent more than 72 hours of research, consult with a couple of renowned pet specialist and few famous pet car seat manufacturers to review the top choices for both of you and your pooch. 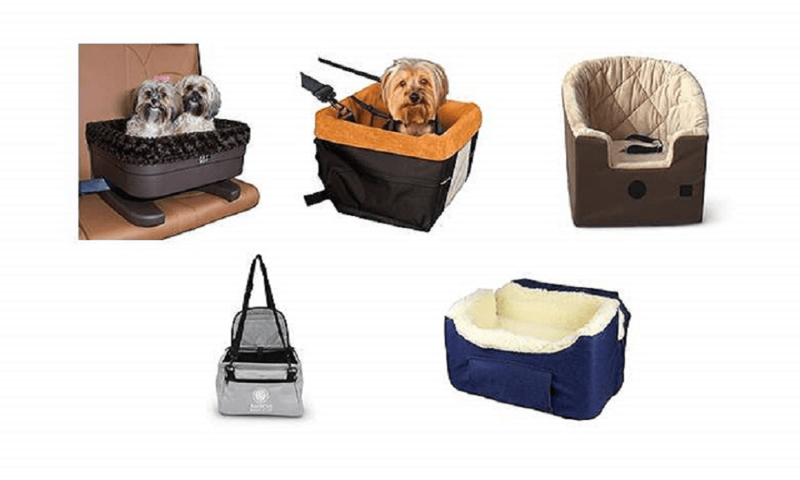 If you love the company of your pooch during vehicular journeys and want to keep your furry friend fully safe from any hazard, you can choose any one from these dog car seat regarding your dog’s size, weight and habit to get the best support. Snoozer lookout car seat provides your pet a cozy and safe place to ride in the car while moving on near and far. It is foam made dog car seat able to manage enough cool air circulation. Snoozer car seat is medium but the height is enough tall with the little front dip, where your dog is 100% secured. The amazing K&H Booster Bucket seat adjust your pet either the front or back seat. It is designed for a better fit inside the car and put together to be robust and withstand most aggressive dogs. The inner sides of the booster bucket enhance the comfort of 3-inch foam cushion made of soft fleece. Snoozer Lookout is an amazing dog car seat for those are well-behaved in the car to ride while on the move. It is specially designed for pets up to 25 pounds and offers comfortable coverings and padding for a happy and secure journey. The installation of this car seat is very easy, just the seat belt cross through the back of the seat and held up in the air and you can also carry your dog lie down with this seat. K&H Pet bucket pet car seat structured a place inside the car that fit nicely in the back seat or front seat beside you. It is designed with the thick wall and the inner surface is covered with fleece to keep your pet safe while the car turns or brake in haste. Solvit dog booster seat car seat mainly designed for puppies and small breeds those are up to 25Ibs. It is easy to install quickly with two adjustable straps and the attachment is completed by hanging the basket on the front of the car seat to allow you to pick the suitable height for your pet. The inner surface of solvit tagalong is padded by fleece and an internal harness to ensure a secure and comfortable journey for your pet. The PetSafe Solvit Pet Booster Seats ensure an ultimate journey for your loving dog. It is best for pups are up to 18Ibs. The unique design of this seat offers your pet to look out the window while on the move. Adjustable straps of tagalong pet booster seat provide you to adjust the perfect measurement for your pet. It is also removable and washable so that you can keep the seat fresh and clean. Kurgo skybox booster seat features a waterproof exterior with metallic structural integrity. The ultimate design is suitable for dogs up to 30Ibs and measures 16 x 12 x 8 inches. It can be installed quickly and securely at the front or back of the seat. Enhance security by attaching the adjustable seat belt to any dog harness. Kurgo is a dedicated world-renowned company firstly ensures customer’s optimum satisfaction with the lifetime warranty for this dog car seat. Snoozer Console dog bed car seat offers a large variety of pet car seat industry. These are more affordable for the pet owner and have numerous styles with various colors. The large size is recommended for dogs up to 12Ibs and small size up to 7Ibs. It is better to compare your dog size with the dimensions of dog car seat for ultimate adjustment. Small size 15″ L x 8.5″ W x 6″ H – up to 7 lbs. Large size 19″ L x 12″ W x 7″ H -up to 12 lbs. Pet booster seat for car provides your dog a better view and keeps safe and comfortable while moving on. These dog booster seats are made of the collapsible solid metal frame to sustain the lifetime. An adjustable leash hooks from inside the car seat to the dog collar so that your dog feels more comfortable. Suitable for dogs up to 20Ibs. Hammock dog seat covers for car constructed of heavy-duty oxford fabric and comfortable cotton mat. Its adaptable split zipper allows sharing the back seat so your pet and kids can travel together. This seat cover completely protects your seat from any scratches, dirt, liquid and other similar issues. The non-slip surface prevents your dog from slipping and Velcro openings for seat belts. We looked at 40 other dog car seats. While the options below didn’t make our top 5, they’re still the best of the best and worth consideration if one of our top 10 picks doesn’t fit the bill. The information you’ll need to compare each one is included with the listing. The American kennel club pet booster seat ensures a safe and secure ride for your dog or cat in the car while moving on. This seat is designed for small dogs up to 20 pounds in weight. There is unique construction for a dog safety where a built-in leash attaches to any collar or harness for the more secure ride. A zipper pocket on the front side of puppy booster seat facilitates for folds and compact storage. Snoozer dog car seat provides your pet the absolute place to ride while on the move by car. It is made with simulated lamb’s wool interior ensures a comfy and safe place for your dog. Their connection strap included for the seat belt to join the harness. Made for pets up to 25 pounds and it contains some extra facilities for dogs rather than other dog car seat. It has a special rack and you can feed your dog on the move. Pet Gear dog seat covers for car constructed of heavy-duty oxford fabric and comfortable cotton mat. Its adaptable split zipper allows sharing the back seat so your pet and kids can travel together. This seat cover completely protects your seat from any scratches, dirt, liquid and other similar issues. The non-slip surface prevents your dog from slipping and Velcro openings for seat belts. Solvit Dog Car Seat allows your pet to a comfortable ride with spacey interior above the vehicle seat to provide your pet a nice and clear view. The solvit pet safety seat is easy to quick install in the front or back seat integrates with the seat belt to ensure additional security. This car seat is removable, washable, to keep fresh, clean and healthy. Solvit Pet Booster Seat contains the unique design which allows the seat to hang from the padding and supports the seat from below. Most suitable for dogs up to 18Ibs and the structure of the seat measures 16 in. x 13 in. x 8 in. Solvit tagalong pet booster seats are comfortable to use which raise your pet up to the level of your car’s rear window to keep them fully entertained while on move. Pet booster seat provides a comfortable ride with entertainment and helps to keep your pet safe. Its unique design facilitates to set the car seat at the place inside the car from where your pet looks out the window with ease. Solvit dog safety seat quickly installs in the front or back seat and vehicle seat belt provides an extra security for your dog. HDP Car Booster Seat is the ultimate solution for your dog to look out the window to enjoy the natural beauty while riding the car. Its unique design is special for super quality and great size which is 14.2 x 9 x 14.2 inches. Its safety strap connects to pet collar for providing more security. Suitable for pets up to 20Lb. Petego pet tube car kennel designed by emanuele bianchi, which is lightweight but structured with super strong fabric kennel to provide a smart traveling opportunity for your pets. Its claw proof fabric makes the seat strong and durable. The petego pet tube kennel gives your pet enough accommodation facility to move with sufficient security. Petsfit Large dog booster seat perfect for growing puppy measures in 29 inches long by 16 inches wide. An ideal dog car seat perfectly set in the back seat and keeps your dog safe, secure and comfortable. The appropriate size is 29.5″Lx16″ Wx14″H and suitable for medium sized dogs up to 45 pounds. It is great for use in hot and cold weather. Dog booster car seat is a great way to ride your loving pet on the road. It’s a padded and secure place for your pet while traveling and it is easy to quickly install. Available adjustable straps facilitate to install in almost any vehicle to ride. The actual size is 16″L x 12.6″W x 9.5″H, fits small pets. Snoozer luxury high back console pet car seat attaches to your vehicle’s console to place your pet in the right area inside the car. Snoozer luxury lookout allows your dog to easily look out the window to entertain from the outside scenario while moving on. To get the appropriate size consider the measurement first and that is 20″L X 12″W X 7″ H FRONT/12″H back for exterior dimensions and 17”L x 9”W x 5”H FRONT for interior dimensions. Included security straps ensure more safety and security for your dog. Pettom pet car seat made from durable oxford fabric, its rear seat belt slits for solidity, and security. It has exterior pockets for storing your pet’s essentials. Provide a comfortable space when traveling and keep your pet cool in the seat. The dimension of this product is 16 L x 13.5 W x 12 H able to tolerate up to 20Ibs and 15”L×12.5” W×9.5”H fit pets up to 15 lbs. Suitable for puppies, cats and small dogs for traveling in the car. Pet booster seat for car allows you for a secure and comfortable drive with your pooch. Adjustable safety leash keeps your pet safe and secures while moving on. The zippered front compartment allows you to bring favorite toys and treats for your pet. The actual dimension is 12.00”w x 8.00”H x 10.00”D ideal for small pets and dogs up to 10Lbs. The removable soft faux sheepskin liner helps to remove for washing and cleaning. Outward hound car seat helps to keep your pup safe in the back seat during drives. High-quality performance gear allows your pup secure for every new adventure. Its elevated design facilitates your dog to look out the window for enjoying outside scenario.it is easy to install an outward hound dog car seat and folds flat for restoring if necessary. The small sized car seat is ideal for 10Ibs and the medium-sized car seat is for 20Ibs. Dog travel seat offers your pet a safe and comfortable ride and you should no longer worry about your pet falling out from the seat even when you take turns on the road. It is easy to install with the strap to the back cushion of the chair. The zippered front section allows keeping your pet’s favorite treat and foods. So, dog booster is a quality dog car seat with 100% money back guarantee for any dissatisfaction. Collapsible seats contain your pet in a safe area inside the vehicle where is no restriction for free movement. Lucrative abstract mesh sided design attract your pooch to enjoy the ride. It elevates your pet window view for outside visibility and comfort. Adjustable straps help for easy installation in front or back seat. Suitable for cats and dogs are less than 12 pounds. Animal planet booster seat makes a safe ride while in the car by providing enough clear view from the window at the outside. Easy to install quickly and remove securely to keep it fresh and clean. Adjustable tether facilitates to attach easily to the dog harness. Appropriate for dogs up to 12Ibs. Cozy boost dog car seat specially made for small pets up to 12Ibs. It includes collapsible silicone dish to fit luxury blanket for the particular seat. A safety seat belt attaches to harness for highest security. Designed with quality materials to keep your pooches cool in the summer and warm in the winter. You will get lifetime warranty to purchase this dog car seat or 100% money back guaranty. The A4Pet booster seat for dog or cat is absolutely a large seat in size specially made for the dogs are biggest sizes and that doesn’t have the weight limit. This dog car seat is foldable, portable, removable, and washable so that, the original structure could be folded down for better storage. You can use this multifunctional pet bed as SOFA or BED at home and feel cool in summer or warmth in winter. PAWOAH pet dog car seat is easy to install in the car without damaging car interior. Durable and long lasting with a protective cover that won’t hurt your dog. It provides a comfortable view outside through the window and your pet can enjoy all outer scenarios. An included net barrier is easy to install and remove with adjustable hook strips. So, you can keep your pet at the back of the driving seat to make a safe drive. Snoozer lookout car seat allows your pet to ride with style and comfort. These luxury dog car seats made with zipper removable sophisticated microsuede cover and your pet enjoy the journey with the new car seat. Included connection straps enhance security level to join with the harness. Snoozer Luxury Lookout Travel Rack facilitates to have food and other essential elements on the go. Booster pet car seat designed with heavy duty quality cloth material for long-lasting use. Added soft blankets make your pet warm in winter and cool in summer. The harmonious colors also adjust suitably with the car seat and provide a nice look. Encourage your pet to travel at outside by sharing window view on riding. Easy to install and remove for quick cleaning and storing. PupSaver crash tested dog car seats are constructed according to FMVSS guidelines. It is only crash test-worthy dog car seat on the market works with vehicles SRS and provide maximum safety and impact protection beyond restraint. The soft, ballistic poly-filled car seat is sturdy and durable ensure the highest convenience for your pooch. ASPCA Booster provides a custom fit for any size of a dog. Its built-in leash connects with harness or collar for the more secure ride. Include zipper pocket on front side gives an opportunity to bring food or other pet essentials and helps to prevent sudden car sickness. It is easy to install with straps from the body to the top of the seat. Its back pad provides comfort and support to protect the seat from pet hair. Pet car seat carrier is suitable for pets up to 15Ibs. Its 2 in 1 carrier absolutely perform as a pet carrier and car seat. Adjustable straps help to fit in any vehicle and for more safety the attached ring hooks with the harness so that your pooch won’t jump out. So, it is the proper solution to save your dog and entertains by the natural look from the window. Pet car booster seat carrier is a secure padded place to enjoy traveling with pets. It is made with the sturdy and durable material with mesh fabric to provide a comfortable environment inside the car and suitable for small pets are less than 25Ib. The frame constructed with two metal rods assist to seat upright. Available front zipper pocket allows storing various pet essentials with food and treats. Mpow upgraded car seat covers constructed of heavy-duty oxford fabric with the triple layer for comfort, durability, and safety. It is very convenient to install with quick release clips. Removable, waterproof and easy to clean for restoring or further use. Included anti-sleep backing helps your pet to stay in place snugly and the good sense of comfort during transport. Large dog car seat allows 2 puppies or doggies and has the capacity to tolerate up to 300Ibs. Available security leash, seat belt loops, and sling make it sturdy and strong to keep your pet more safety while driving. The original structure of this bed facilitates to fold for easy carrying and restore for further use. The additional facility of this bed which is MULTIFUNCTIONALITY, you can use as SOFA or BED in your room beside using a dog car seat. OAKZIP Pet Reinforce Car Seat constructed of high quality, PVC mesh material, and thick oxford cloth provides your dog a comfortable accommodation inside the car. The D rings metal and other two strong bars enhance the support force. The designated height makes your dog look out the window and enjoying the outside scenario. Top quality buckle and belt ensure long service life. Its front storage pocket gives the opportunity to store water, food, and other essentials. Co-Pilot dog car seat for dogs works for all car seat belts. This lightweight dog car seat made of dense foam to provide a comfortable accommodation. Easy to install, just loop the seatbelt in the buckle and there are no straps to confuse you. Comparatively smaller dogs love this seat because it provides facility to see out the window to enjoy the nature. Pet booster car seat makes your dog happy while moving on the ride. It is designed with adjustable straps to fit more with the dog harness. It is easy to install and folds to restore when not in use. The best fit for small pets up to 20Ibs. A zippered front compartment makes a suitable place to keep your dog’s favorite treats, other foods, and essentials to provide a happy ride. Henweit car booster seat made of high quality waterproof 600D oxford material that is sturdy, durable, non-sticky and machine washable. It is a useful item to travel a pet who wants to offer a safe and comfortable place to their pet inside the car. The adjustable leash ensures your pet’s safety and a zippered front pocket offers a convenient place to store foods and essential elements. WH SHOP protect pet car seat ensures a complete protection to your pet at riding time. It is high enough to resist your dog from jumping inside the car. The seat cover made of polyester materials which make sure the guaranty to use years of time. The installation process is so easy just clipping on headrest connector buckles and pressing the anchor to keep in place. WOpet Deluxe pet booster seat fits for small pets with you on the road. It’s a secure and safe place for your pet to enjoy traveling. Like other car seats, it is also easy to install quickly and a zippered front facilitates to carry various pet essentials. The appropriate size is 16″L x 12.6″W x 9.5″H for this car seat and proper for dog or cats up to 30Ibs. COLEYOUB portable pet car booster enhances your pet’s travel experience with you. It is suitable up to 20Ibs and actual size is 16″L x 12.6″W x 9.5″H. There is a ring to hook the harness so that it doesn’t jump out. The back, front and bottom with PE clapboard where the bag edge full of foam bar. To increase the support force there is two fixed metal bar the seat. The product is lightweight only 2 pounds, removable, washable and foldable to keep store when not in use. Precious booster high-density foam car seat keeps your dog safe and comfy while riding in the car. The actual measurement for this seat is 19″ L x 16″ W x 13″ H which is fit for pets up to 20Ib. Designed by two inches thick, high-density foam walls. This safety medium car seat comes with a leash strap to ensure the highest security. A microsuede zipper removable cover is easy to clean for further use and restore. Booster carrier pet seat car is made of durable oxford fabric, which is strong anti-skidding and waterproof. Designed with adjustable straps for proper fit and a ring hook the harness so that it will not jump out. It offers your pet a sound environment to stay quiet when you drive the car. Durable PVC Mesh surface make your dog warm in winter and cool in the summer. Waterproof booster dog cr seat provides a supreme comfort and makes your pet happy in the car riding. It is easy to install quickly on front and back seats. A short leash connects to the pet’s collar and durable nylon straps have the quick release button. The premium quality pet car seat has the capacity to hold up to 20Ibs. Holds Pets up to 20lbs. The booster seat offers a better view, large space to keep your pet secure and comfy and let your pet enjoy the journey with you. The double safety environment ensures two buckles booster seat to enhance security with your car’s buckle. The foldable 4 zippers design provides the convenience to fold flat just like a real bag for storage. It is a waterproof dog car seat easy to remove and clean. Pet weight should less than 25 lb.